Digital marketing is always advancing, if you’re not moving forward, you’re moving backward! Our Growth-Driven Design process approaches marketing as a living, dynamic system. Far from the “set it and forget it” mentality of traditional marketing approaches, we actively manage our client’s marketing. Focused on company-wide goals, we seek continuous improvements. The aim is to collect real data from your website, and track what actually works. Through a cycle of learning, sharing, execution and analysis, we help our clients optimize their marketing efforts over time, improving results moth over month. Each month of a client engagement follows a customized marketing plan. Together, we build a natural progression of increased activity that follows logically from the marketing activity that came before. At the beginning of each month, we meeting with your key stakeholders and apply lessons learned from the previous month and earlier stages. The goal: execute better, more sophisticated and more effective marketing campaigns each month. We build execution into every marketing strategy. We start with the smallest, meaningful, and ‘launch-worthy’ components, then follow a rigorous growth-driven design process (learn more about Growth-Driven Design here), month-over-month, to continue to tell your story, better and better. The goal: execute better, more sophisticated and more effective marketing campaigns each month. Sound interesting? We can tell you more in person! 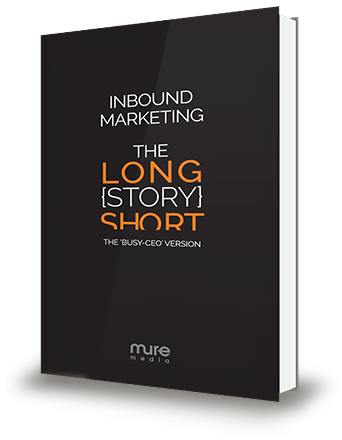 This guide, written for the busy CEO, gives an overview of how inbound marketing works faster and with less expense to deliver on your investment than traditional marketing.